For thousands of years people wrote and drew on parchment, a material made from the hides or skins of sheep, goats and calves. Parchment is different from leather because it is not tanned. The hide is cleaned, rinsed, scraped, stretched and dried to produce a stiff, white, translucent surface for writing. For important documents vellum, made only from calf skin, and parchment were preferred over papyrus because they were able to be more easily inscribed on both sides, were not as subject to humidity or tearing, were able to weather a knife that scrapes away mistakes and were much more durable. 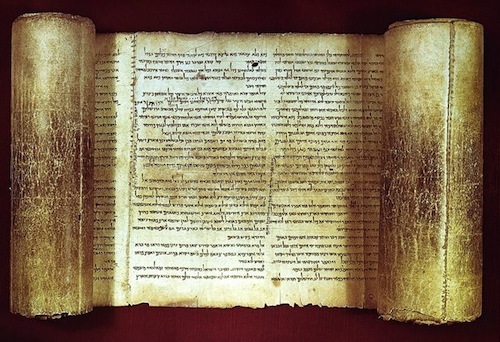 The important Isaiah Scroll (aka 1QIsa) Of the Old Testament discovered in 1947 in the caves near Qumran is written on 24 feet of parchment with black ink made from carbon mixed with natural gums. 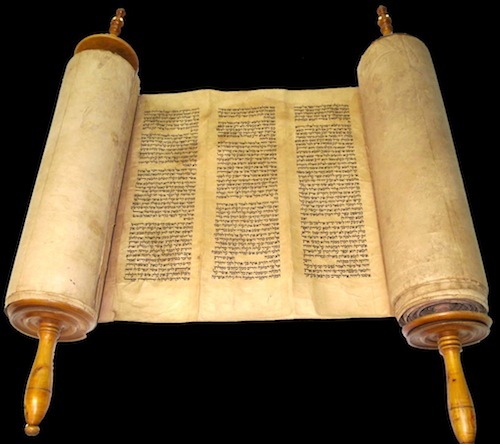 Testifying to the superiority of parchment, it has been preserved in tact for over 2,000 years. Parchment, also, could be reused for another book. 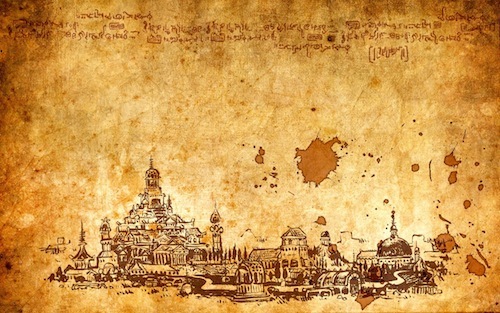 To get rid of the current writing on the parchment, the page was scraped (erased) with a knife and the scribe wrote over whatever was previously there. This type of parchment is called a palimpsest from the Greek words palin (“again”) and psan (“to rub”). The most famous palimpsest in modern times is the Archimedes Palimpsest—a small, 13th century, 174 page Byzantine prayer book written in Greek. 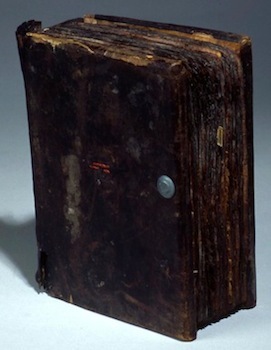 The prayer book known as The Archimedes Palimpsest. Play below to see the pages turn. It had been charred by fire, was moldy and was almost illegible. 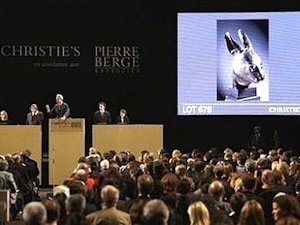 It sold for 2.2 million dollars because the erased texts under the prayers included treatises by the greatest mathematician and inventor of the classical world, Archimedes of Syracuse (c. 278-212 BC). Two of his works, The Method and Stomachion, are found nowhere else. 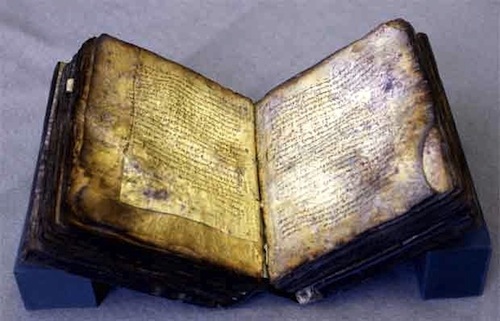 The Christian prayers in the prayer book, or euchologion, are of interest, but the group of scientists that have been studying the palimpsest are recovering, using modern imaging tools, seven treatises of Archimedes leading them to conclude that the majority of the pages in the prayer book came from an 11th century parchment book containing the works of Archimedes. 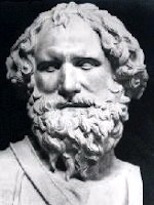 They have, also, found under the prayers some unknown works by the 4th century BC orator Hyperides, an unknown commentary on Aristotle’s Categories and 20 pages from four unidentified authors. The American owner of the Archimedes Palimpsest has not been identified and is known as Mr. B, but on that afternoon at Christies he finessed the Greek Orthodox Patriarch of Jerusalem who had said it should be returned to them because it was stolen from their library centuries ago, and Mr. B outbid the Minister of Culture in Greece for one of the most important erased and reused parchments ever discovered.